The H304 Finesse is constructed of sealed waterproof high density foam which provides additional comfort and positioning over traditional raised toilet seat options. 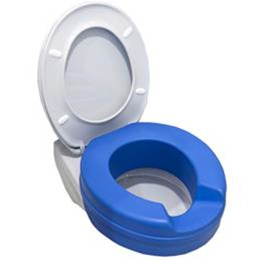 The H304's attractive blue finish accommodates users with visual impairment while ensuring simple, secure, tool free placement over the toilet bowl. The 3.5" of additional seat height and smooth surfaces provide safe, simple hygiene and enhanced outcomes in patient care.